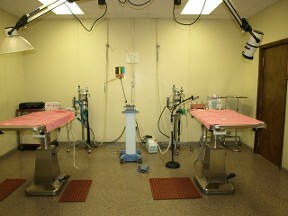 Towne & Country Veterinary Hospital is a full-service facility. When you contact our office, one of our veterinary trained receptionists will help you by scheduling an appointment, checking on your hospitalized pet's status, answering your questions, or if necessary directing your inquiries to other appropriate personel. When you enter our office you will see a spacious, clean waiting and reception area. If your pet is scheduled for an appointment you and he or she will be seen into one of our six exam rooms by a staff veterinarian or licensed veterinary technician depending on the type of appointment scheduled. If hospitalization is required your pet will be admitted and made comfortable in one of four separate ward areas. Please feel free to ask a staff member for a tour if you wish to see where your pet will be staying. To provide the complete care your pet may need, you will find our practice provides laboratory, radiology, endoscopy, ultrasound, surgery, regular hospital and isolation wards with ICU capability, and a surgery suite for soft tissue and orthopedic procedures all under one roof. Towne & Country Veterinary Hospital is an advanced general practitioner for your pet. For the exotic pet, we have doctors on staff who have experience in exotic care. Our office may not provide CAT scans, radiation therapy, bone plating, or brain surgery but if your pet requires more advanced care than our office can provide, we will gladly refer you to the appropriate specialists at your request.